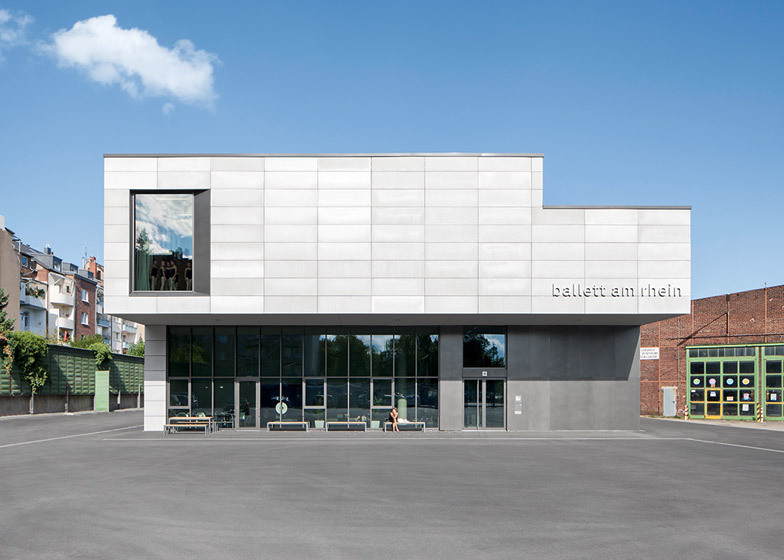 An overhanging upper storey clad in concrete panels leans out over the glazed entrance of this ballet rehearsal building, added to a former transportation hub in the German city of Düsseldorf (+ slideshow). 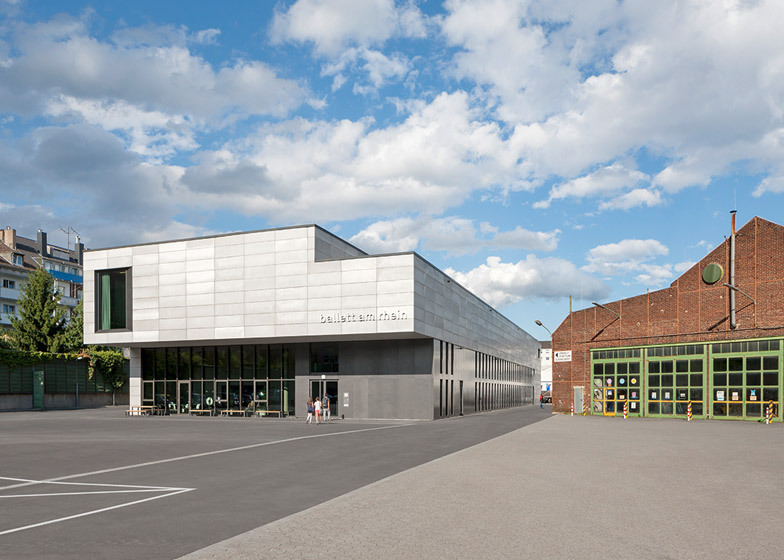 The three-storey building designed by Hamburg office GMP Architekten for the Deutsche Oper am Rhein ballet company is located in Düsseldorf's Bilk district, on the site of a depot previously operated by local public transport provider Rheinbahn. It provides the ballet company's approximately 50 professional dancers and 55 students with facilities including two ballet rooms with full-size stage dimensions, three smaller practice spaces, changing rooms, a physiotherapy room and an apartment for guest artists. The Am Steinberg site will see apartments constructed within a former bus depot, while two listed tram sheds are being converted into workshops for Düsseldorf's arts academy. Historic trams will be on show to the public in one of the old sheds, which will also house more apartments. The industrial heritage of the site informed the new building's shed-like form and the simple palette of raw materials. 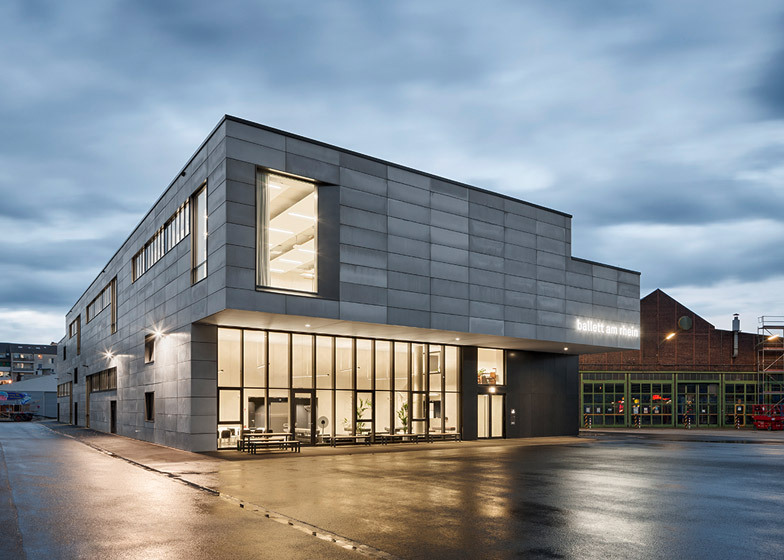 "The architectural style and the associated materials and colour scheme make deliberate reference to the industrial character of the place, giving the building its workshop and atelier ambiance," the architects said. An open plaza in front of the building leads towards an entrance sheltered beneath the cantilevered volume containing one of the practice spaces. An overhanging upper level was also used by Y+M Design Office for a ballet studio in Japan. The double-height foyer is lined with glazing. This transparent surface contrasts with the rest of the building's exterior, which is clad in sections of fair-faced concrete. The prefabricated concrete panels are mounted on the facades to create a non-load-bearing curtain wall with a varied texture that enhances the facility's technical aesthetic. "As a workshop in the sense of an experimental and creative space, and as a place of incompleteness in a positive sense, the building is not embellished with a prominent colour scheme in the quest for dominance," the architects said. "This approach is continued in the interior – colour and materials are deliberately restrained and the walls are left in fair-faced concrete." 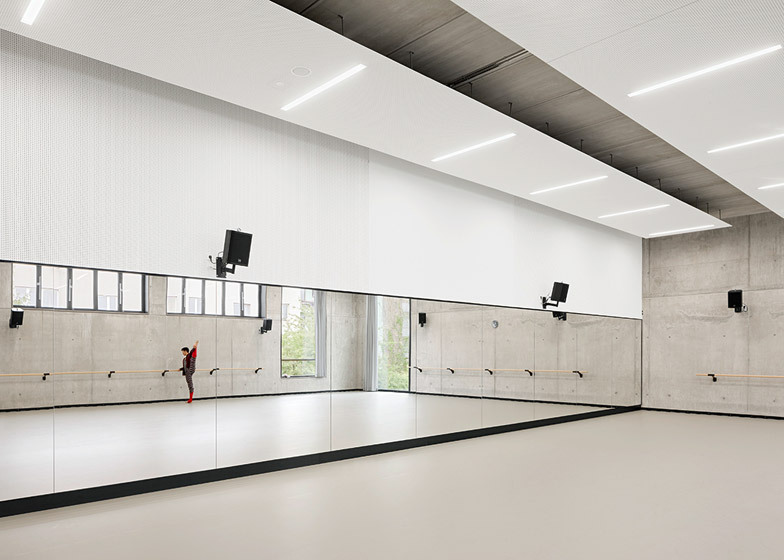 The minimal material palette is applied throughout the building, including in practice rooms with mirrored walls. Large entrance areas for these rooms provide a buffer, minimising disruptions to dancers practising in front of the mirrors. The foyer connects with circulation areas including a corridor leading towards the ballet rooms and two staircases that ascend through the building. 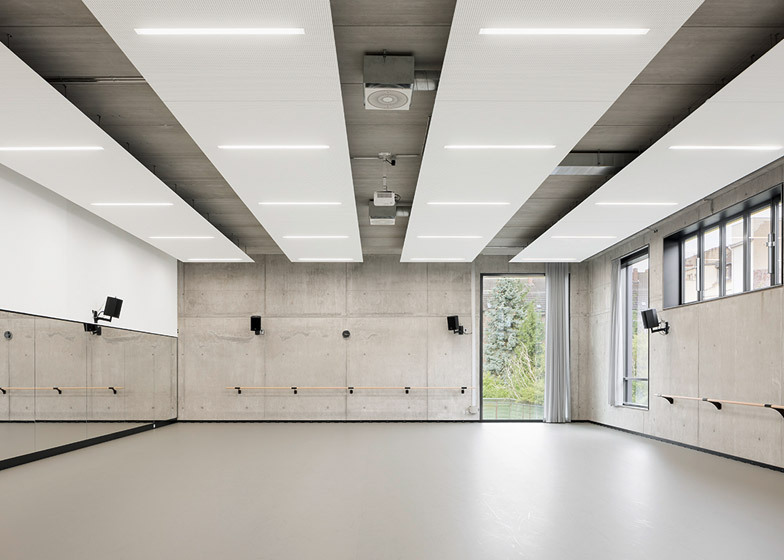 The double-height ballet rooms are stacked along one side of the building, while the other side accommodates the changing rooms and other service spaces. 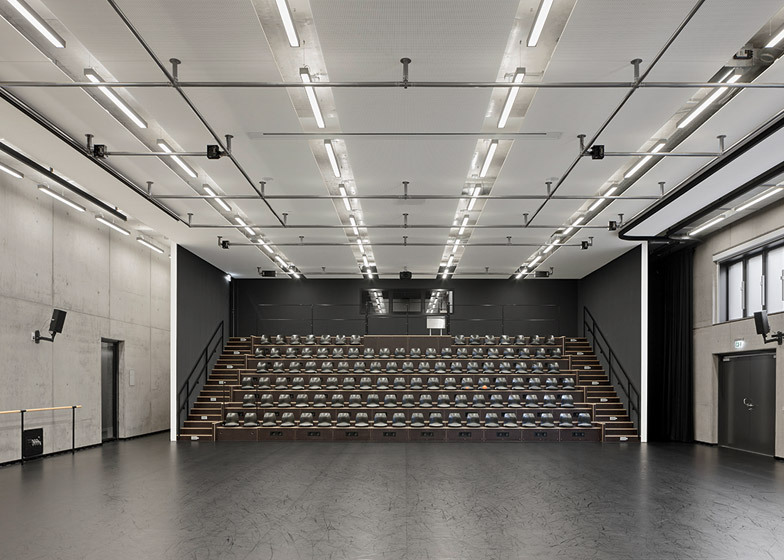 GMP Architekten's previous projects include a stadium in the Amazon rainforest that was used during the FIFA World Cup 2014 and a faceted entertainment venue in Azerbaijan.